It there were any questions on global warming at Thursday’s Capital Region Envirothon, “No!” would have probably been an acceptable answer. That’s because it was snowing. And when it wasn’t snowing it was raining, And blowing. And getting ready to snow again. It chilled, but didn’t stop, the nearly-20 teams competing for first-place honors in the Schoharie County Soil & Water Conservation District-sponsored event. 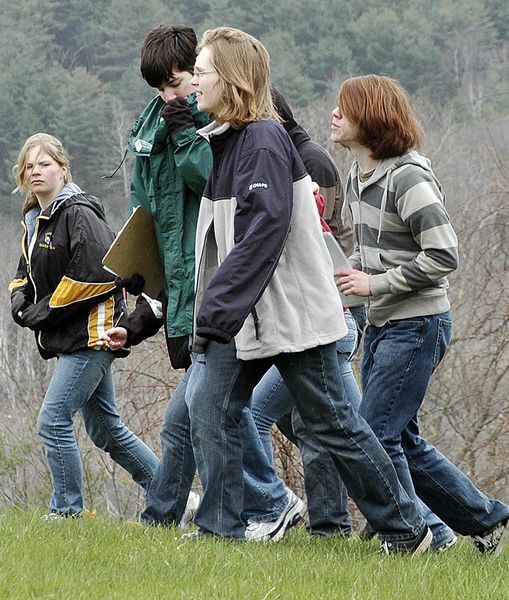 The 2009 Envirothon title went to EST Senior, with 383.5 points. Second place were the Sharon Badgers with 342.4 points. The Badgers were also the top-placing Schoharie County team and with other county winners, advance to the NYS Envirothon in May at Keuka College. Third place overall went to Duanesburg’s “A’ team with 330 points. Other county winners were: Tech Valley 1, Rensselaer County; EST Senior, Schenectady County; and Watervliet Seniors, Albany County. Other local teams included: Sharon Springs Barn Owls, 330.0 points; Sharon Springs Plankton, 312 points; Sharon Springs Cattails, 289.8 points; Middleburgh Dames, 318 points; Middleburgh Gorilla Girls, 216.6 points; and DCS “B”, 321.2 points. The day-long event, held at the New York Power Authority’s Blenheim-Gilboa Visitors’ Project, quizzed students on their knowledge of aquatics, soils, wildlife, and forestry. Some of the stations were moved inside—or at least under tents—because of the weather.